Transparency Market Research (TMR) has published a new report titled, “Breast Reconstruction Market - Global Industry Analysis, Size, Share, Growth, Trends, and Forecast, 2018–2026”. According to the report, the global breast reconstruction market was valued at US$ 893.7 Mn in 2017 and is projected to expand at a CAGR of 4.8% from 2018 to 2026. Rise in prevalence breast cancer, launch of new products by companies, and use of silicone breast implants and acellular dermal matrix for breast reconstruction are anticipated to augment the global market from 2018 to 2026. Prevalence of breast cancer among women is increasing. After skin cancer, breast cancer has the highest prevalence among women across the globe. According to the World Cancer Research Fund International, nearly 2 million new cases of breast cancer were reported globally in 2018. Belgium, Luxembourg, and the Netherlands are the top three countries in Europe with the highest rate of breast cancer. According to data provided by the Continuous Update Project Panel of World Cancer Research Fund International, consumption of alcoholic drinks is one of the primary causes of premenopausal breast cancer. 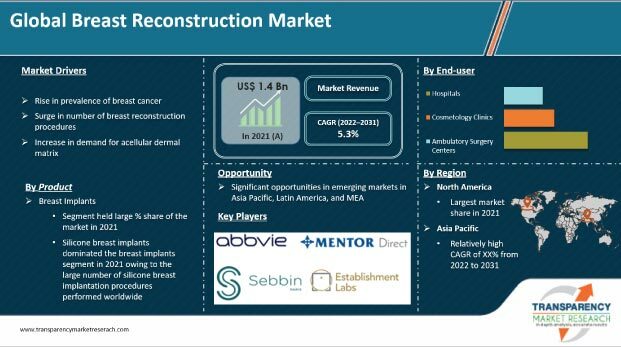 Leading players in the global breast reconstruction market have launched new products such as silicone-filled breast implants, acellular dermal matrix, and tissue expanders. Usage of acellular dermal matrices in breast reconstruction has increased due to rise in awareness about single-stage breast reconstruction. For instance, in September 2018, Mentor Worldwide LLC launched CPX4 Smooth Breast Tissue Expander in the U.S., thereby expanding the line of CPX4 Breast tissue expanders that can be used in prepectoral and submuscular breast reconstruction. Product recalls by regulatory authorities such as the Food and Drug Administration (FDA) and the National Agency for Medicines and Health Products Safety (ANSM) affect the revenue and market share of companies. In February 2014, ANSM recalled Cereform silicone gel-filled breast implants, as the sterilization process for the manufacture of the implant was not as per the set international standards. Additionally, in November 2014, the Therapeutic Goods Administration (TGA) suspended the sales of Cereform. Hence, product recalls are expected to restrain the market during the forecast period. In terms of revenue, the breast reconstruction market in Asia Pacific is projected to expand at a high CAGR during the forecast period. Factors driving the market in the region are increase in awareness about breast reconstruction after mastectomy and use of acellular dermal matrix to support breast implant. Furthermore, geographical expansion & launch of new products by market players, product approvals in Japan and China, and increase in the number of women opting for breast reconstruction propels the market in the region. According to the American Society of Plastic Surgeons, in 2017, Japan reported the largest number of breast procedures in Asia Pacific, accounting for 0.3% of the breast procedures performed globally. Moreover, rise in focus on women’s health and availability of technologically advanced medical devices for diagnostic and therapeutic purposes in countries such as China, India, and Australia are expected to boost demand for breast implants. This in turn is likely to augment the market in Asia Pacific during the forecast period. The report also provides profiles of leading players operating in the global breast reconstruction market. These include Allergan, Mentor Worldwide LLC (Johnson & Johnson), Sientra, Inc., GC Aesthetics, Establishment Labs S.A., POLYTECH Health & Aesthetics GmbH, RTI Surgical, Inc., Groupe Sebbin SAS, Integra LifeSciences, and Wanhe. Increase in sales of breast implants is an important factor for the key players in the market to generate high revenue. Development of customized breast implants and increase in research & development activities in biologics for breast reconstruction are anticipated to create significant opportunities in the market.